Join us for Game Changer Thinking Interactive May 15, 16 & 17, 2014 in the Palm Beach, Florida area. Our theme is 'Think Through it and Do It' where you'll learn insights, tools and strategies to choose, create and develop a business start up or revamp program. You'll learn how to gain instant workable 'expertise' in a chosen topic, how to position, package and present yourself to ramp up a viable business. You'll practice sharing your business and could even pick up some new clients at the workshop! And you'll leave with an action plan of next steps. Registeration will open soon! Early birds will benefit! Gain mental freedom through simple frameworks. Harness natural dynamics to achieve your goals more effectively. Learn tools & techniques to empower individual and group thinking. After each session you have access to theweekly Challenge to practice and apply your learning to your own issues. 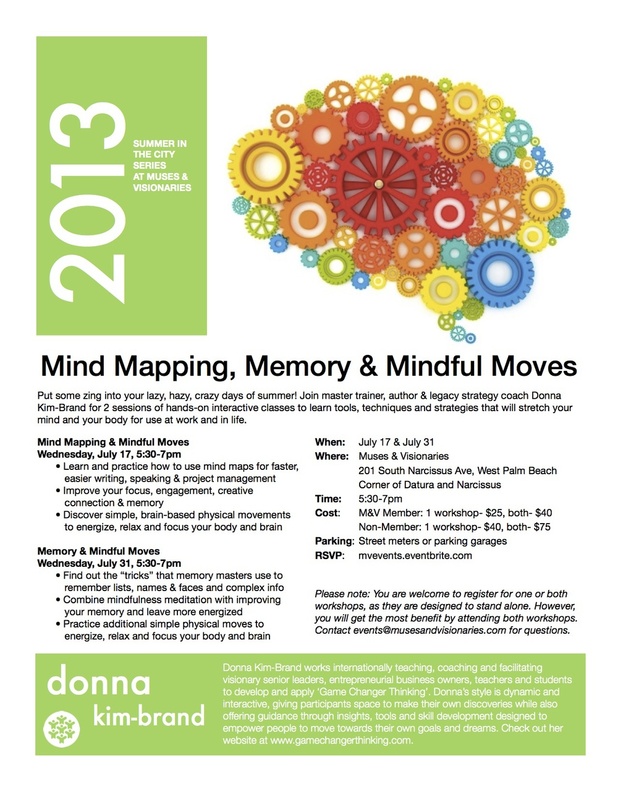 Mind Mapping, Memory & Mindful Moves Live Classes!